But it was more than enough time to see the Jamaican sprinter win his third-straight gold medal in the 100-meter dash. It is the first time a runner has won the event at three Olympic Games in a row. Bolt was not the fastest out of the starting blocks. But he crossed the finish line ahead of American Justin Gatlin. He ran the race in 9.81 seconds. Next, Bolt will try to win three gold medals in three straight Olympics in the 200-meter race. First he must qualify for the final with a good time on Tuesday morning in Rio de Janeiro. The 200-meter final is on Thursday night. Bolt said he will try to break his own 200-meter world record. "I'm going to go out there and leave it all on the track," he said. 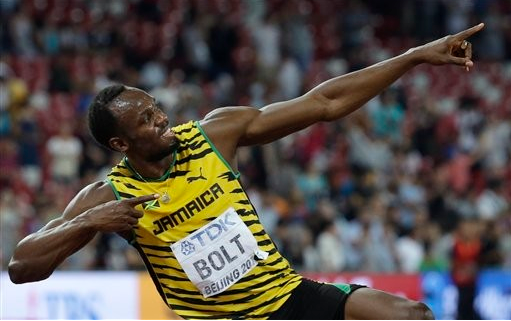 Bolt dedicated his victory Sunday to the people of Jamaica. Also this weekend, Monica Puig of Puerto Rico won the women's tennis tournament. She defeated German Angelique Kerber. It was the first-ever gold medal for Puerto Rico, a territory of the United States. Athletes from the island can choose to represent either the U.S. or Puerto Rico in the Olympic Games. Puerto Rico first sent athletes to the Olympics in 1948. Before the Rio Olympics, it had won eight Olympic medals, but never gold. Puig was a surprise winner. She was ranked 34th in the world before the tournament. "I couldn't really believe what just happened," Puig said. Two rowers from Ireland won the country's first medal of the 2016 Olympics. Brothers Paul and Gary O'Donovan won the silver medal in the lightweight double sculls rowing event. But they gave an interview on Irish television that some said was worth a gold medal. People around the world enjoyed hearing the Irish accents and listening to the brothers talk about their experience in Rio. The video interview has more than 4 million views. "It's been a bit of circus since we finished the race," Gary O'Donovan said. "We're just taking it all in and trying to enjoy it the best we can." American actor Mia Farrow wrote on Twitter that the brothers should get the gold medal for best interview. In the Olympic Games the winner will get a gold medal. It was a nip and tuck race right to the finish line. It remains unknown which country will host the international tennis tournament. 1.It is the first time a runner has won the event at three Olympic Games in a row. Count and see how many trees there are in a row. 2.Bolt dedicated his victory Sunday to the people of Jamaica. As a scientist, he was dedicated to the truth. The exhibition dedicated to those who maintained the fountains in the past.